The fifth season of the sci-fi reimagining will be teleporting to high-definition this November. 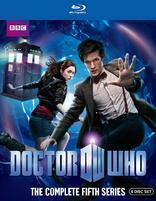 Warner Brothers/BBC has just announced 'Doctor Who: The Complete Fifth Series' for a Blu-ray release on November 9. In the fifth season run of the show, Matt Smith fills the shoes as the new doctor and Karen Gillan as his new companion. Specs and supplements haven't been revealed yet, but it appears to be a 6-disc set. Suggested list price for the Blu-ray is $89.98. You can find the latest specs for 'Doctor Who: The Complete Fifth Series' linked from our Blu-ray Release Schedule, where it's indexed under November 9.